Huawei Technologies Co. Chief Financial Officer Meng Wanzhou is feeling the pinch of the downturn in the once high-flying Vancouver real estate market, with valuations on her two mansions dropping by US$3.6 million. Meng’s houses in Vancouver are currently assessed at a combined $18.3 million. That’s down 16 per cent from $21.9 million during her December bail hearings after she was arrested at the behest of U.S. officials, sparking an unprecedented diplomatic crisis. 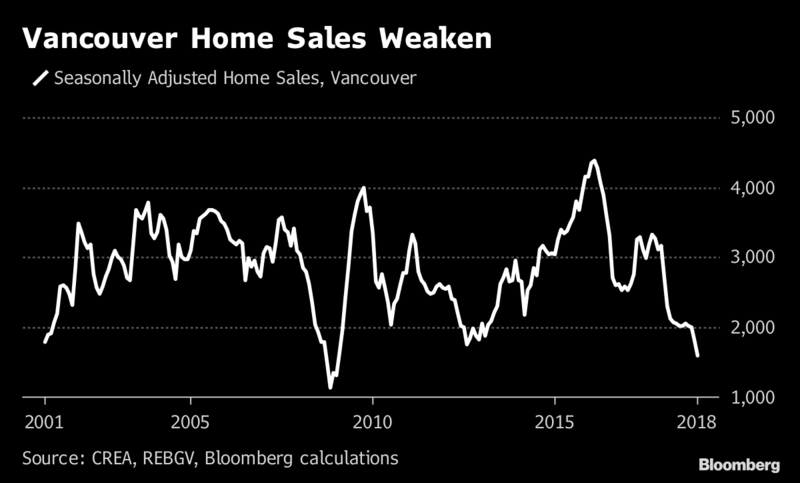 Vancouver home sales were the lowest in nearly two decades last year as a slew of new taxes, rising interest rates, and tighter lending rules weighed on the market. Gone are the days of bidding wars and all-cash unconditional offers for multi-million-dollar mansions. Prices have begun to edge down, and the steepest declines have been at the high end of the market that Meng’s exposed to -- luxury mansions in the city’s toniest neighborhoods. Meng, under house arrest pending a possible extradition hearing, isn’t the only one hurting. One of her bail guarantors will have to post cash after the value of the property he pledged also fell. When Meng was granted $10 million bail on Dec. 11 by the British Columbia Supreme Court, one of the conditions was that she find at least five "sureties," or guarantors who would post collateral to ensure she abides by her bail terms. One of the proposed sureties was her Vancouver realtor, who offered to pledge his $1.8 million home. He failed to gain the court’s approval due to a missing document, so another guarantor stepped in with cash, Meng’s defense lawyer David Martin told the court Tuesday. "Of course money, otherwise, could earn interest," Martin said, as he proposed to swap in Meng’s realtor and return the cash to the interim guarantor. But there was a hitch. "At least until recently, houses would go up in value, but no longer," Martin said with an awkward chuckle. The latest property assessment values the home at less than C$1.8 million, and cash is needed to make up the shortfall, he said. "He has that cash amount and is prepared to pledge it." Justice William Ehrcke granted Meng’s request to swap her surety. No mention was made of whether the other backers, who’d pledged more than $1.3 million in home equity, or Meng herself would be asked to come up with more cash. Meng, the daughter of Ren Zhengfei, the billionaire founder of Huawei, was detained during a Vancouver stopover last month on a flight bound for Mexico. She often spent summers in the Canadian city with her children at one of the two homes she owns. Meng’s next Vancouver court appearance is scheduled for March 6, by which point Canada will have to decide whether to accept the U.S. request and proceed to extradition hearings. Denials are rare and if proceedings start, Meng will have multiple opportunities to appeal. A final decision could take years. The silver lining is that the property market may recover in the meantime. After bottoming out in 2020, residential home sales and the median transaction price in the region will start to rise again, according to Central 1 Credit Union. Vancouver remains the priciest real estate market in Canada, even after the average benchmark price fell 2.7 per cent in 2018 to $1.03 million.